Google PageRank Update - June 2011 - Finally! Even if the PageRank score is slowly loosing its aura amongst SEO professionals and webmasters, it is always great to see that some of your work is paying off! Over the last 2 years, Google got into a good rythm of updating the PageRank every 3 months, but had suddently stopped in April 2010, which was the last time I recorded a page rank update. Some people recorded an update on January 2011, but I did not really see it in Australia. After a long waiting period, Google has finally released Google Product Search, which is essentially a search engine index dedicated to products. We have described the product in a previous post. If you want to access Google Product Search, look on the left hand side of your Google search result page and you will find a yellow icon labelled shopping! If you are a merchant and want to set this up, you will need to register to Google Merchant Center and submit your feed. Recently I had the opportunity to work on a global paid search campaign targeting multiple languages and locations. Although languagelocation targeting in Google Adwords appears to be pretty simple, some aspects can be slighty more complex. The main criteria that Google uses to determine a user location, is the actual Google domain they use. For example someone search in Google.de, Google will assume that the user is more likely to want to see German ads rather an English ads. What is often misunderstood with location targeting, is that locally targeted ads wont always display to users physically located in a specific region. Another example, the same person in Australia, searches in Google France for the term 'Accommodation New York', the user is likely to see ads targeted at France, but also ads regionally targeted to New York, once again the Australian user is not likely to see Australian ads. When setting up a location targeted campaign, it is important to remember these details to be sure to understand the audience of your ads. Targeting becomes more and more interesting (and complex), when you bring languages into the equation. Google offers the option to target up to 40 languages, which is great. 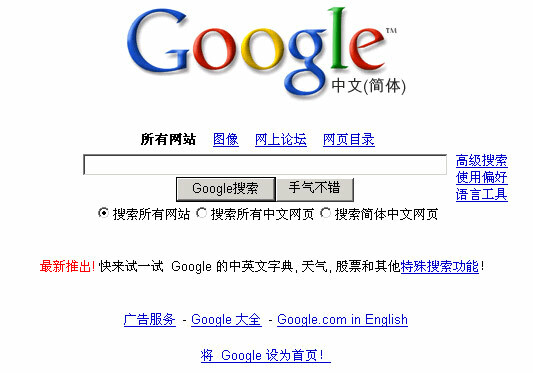 To target ads at specific languages, Google looks at the language of the Google interface. If you are not sure, which language is your interface set to, you can see your interface language settings in the URL when you make a search. Look for the following parameter in the URL "&hl=en" - in this case it is set to English. Although it does not really apply to English speaking countries, this element need to be understood when looking at different languages as you might miss out on a large share of audience. For example, you are an Australian retailer and want to sell your product in Spain, you target your campaign at Spain as a country. If you only target your ads at Spain in English, your ads wont be displayed to all users searching in Google Spain with their browser set as Spanish! This is more than likely to reduce the reach of your campaign. Moreover if you want to use multi-language ads, it will be really important to set your campaigns properly to ensure optimum results. Lets say your products are commonly searched in English and Spanish and you want to serve ads in Spanish to Spanish speakers and English ads to English speakers. First, you will need to set 2 campaigns targeting Spain as the location. The campaign using Spanish ads will have to target Spanish only and the campaign using English ads will have to target English only. When someone searching in Google Spain with his interface set to Spanish, the Spanish ads will be displayed. If the interface is set to English, the user will see ads in English. 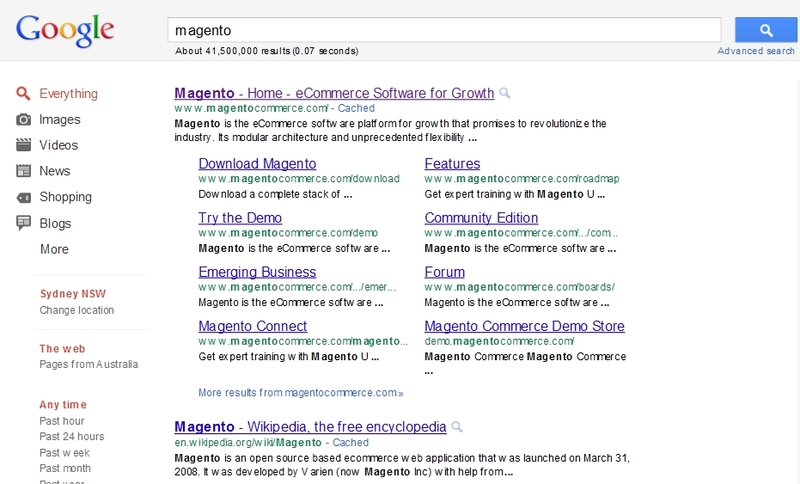 Now, it is also really important to look at the keywords as they will play a big role. If someone searches in English in Google Spain with a Spanish set as the language, the ads will only be displayed if the actual English keyword is integrated in the Spanish campaign targeting Spanish, so your Spainish campaign will need to include both English and Spanish keywords to reach any possible combination of language/locations. Recipe searches account for a large volume of searches in Google as food lovers and cooks tend to use the search engine as their main gateway to access recipes online. Recipes searches have also evolved over time. 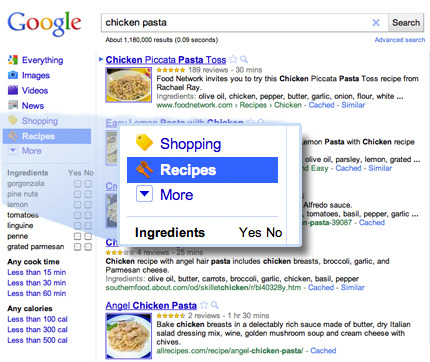 While searching for a specific recipe is still the most common way, many online users tend to look for recipes by typing specific ingredients. To provide a better answer to the changing food lovers needs, Google has recently released the "recipes view" feature ( US and Japan only) . Following the same concept used for book searches and product searches, Google offer the opportunity to filter the search index for food content only. Using the left hand side navigation, online users can choose to click on the recipes menu item, which will display food only content. To provide a better experience, Google also offer advanced search features allowing users to search based on calories, ingredients, cooking time. The recipes listings also display rich snippets providing even more information about the recipe including review from previous users, cooking time, ingredients and more straight in the search result pages. Such feature requires publishers to markup their content with microdata, but is more than likely to provide tremendous benefits in terms of exposure and click through rate. At this stage, the new feature has only been released in US and Japan, but is likely to be expanded to other countries when fully functional. After a quite a lot of buzz, Google Product Search is soon going to be released in Australia. Considering 80% of Australians start their shopping exerience online ( research, review, price comparison), this new product within the Google set of tool is likely to have a pretty big impact on the Australian online retailing and ecommerce industry. Google Product Search is basically a search engine specialising in products. Currently there are Google News (focusing on news search). 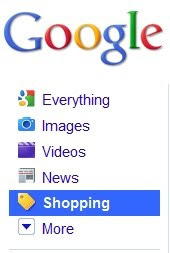 Google Images (specialising on images), but you will soon have the option to search for products only. Google Product Search will be accessible in the same way as Google Images or Google Maps. Either in the horizontal menu at the top left hand side or in the vertical menu on the left hand side of the page. Google Product Search will also be integrated in the Universal search index and display product listings in the organic listings. In terms of look and feel, the Google Product Search result page pretty much looks like a result page from a shopping comparion engine. 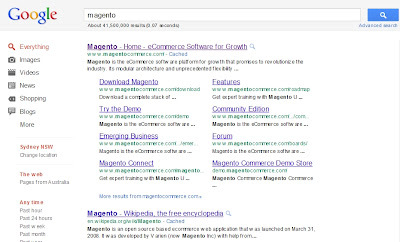 The user types his search and Google lists products matching with the search. The user can then click and compare all the stores selling the product. 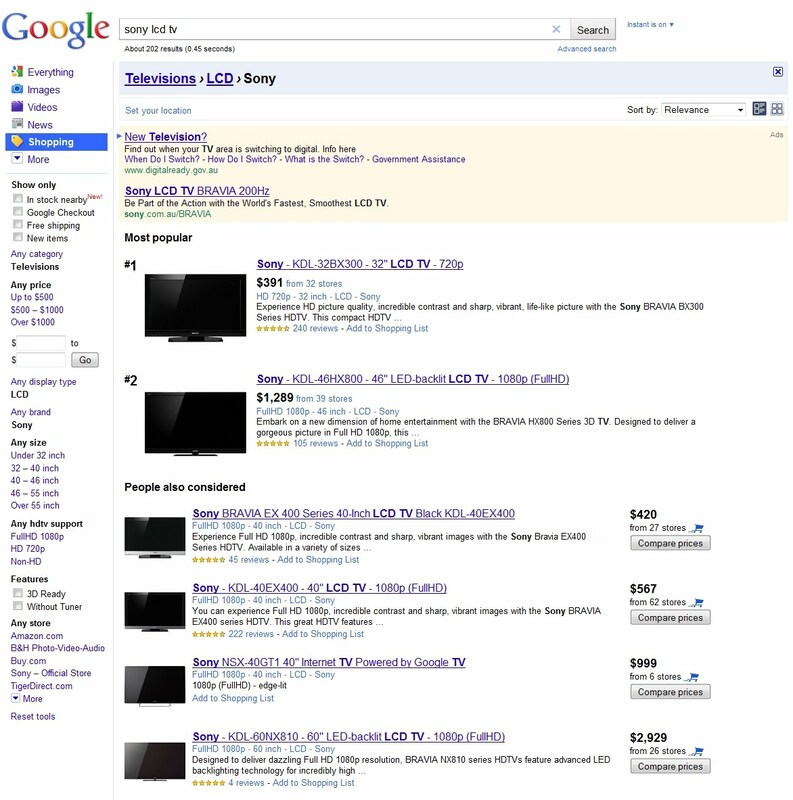 Google Product Search is a great move from Google to support online retailers. In the end, online retail and ecommerce contribute to a large share of searches. Online retailers are also large advertisers on Google Adwords, so it is quite logical to make a product more fitted to their needs. Any retailer can join Google Product Search for free by setting up a Google Merchant account. Once the account is created, a product feed can be submitted directly, providing Google with all the information about your products. On top of the exposure within the organic listings, online retailers can link their product feed (through the Google Merchant Account) with their Google Adwords account to display richer text ads. These new Google Adwords ads formats will provide product and image listings. According to a Google test in the US, these new ads format recorded CTR 8% higher than normal ads. As you can see, there are plenty of opportunities there for online retailers! Back in August 2010, Yahoo and Microsoft announced a search alliance to use the Microsoft technology to power Yahoo's organic search results. On January 15th, Yahoo and Microsoft announced that the search transition between Yahoo7 and Microsoft Bing has been successfully completed in Australia as well as in 2 other markets. The Yahoo! and Microsoft Search Alliance team has reached yet another important milestone today. As planned, we are moving forward with the global transition of certain Yahoo! Search back-end functions to Microsoft’s search platform, and have just completed this process for organic search in Australia, Brazil and Mexico. This news is another step forward for the Yahoo! and Microsoft Search Alliance as we continue our efforts for a quality transition with our worldwide advertisers and partners. Although the transition should be seemless, Yahoo has advised to double check your rankings and set up a Bing Webmaster Tool account to optimise the indexing capabilities. The Search Alliance will have a large impact on the US and Canadian markets, but is likely to have little impact in Australia, which is largely dominated by Google. 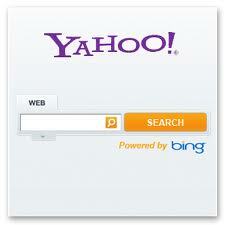 Regarding paid search, Yahoo has announced that the transition will occur in the second half of 2011.